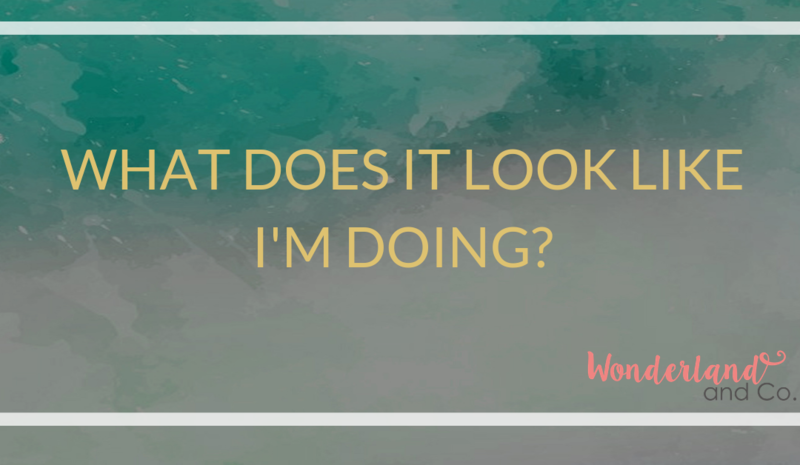 What does it look like I'm doing? - Wonderland & Co. When it comes to struggle, what’s your modus operandi? Last Week we took a look at struggle as a noun, defining what our struggles look like (which is, however we choose them to look). This week, I’m going to look at struggle as a verb. As in how do we struggle? What do we do when we face difficulty? Well, that really depends on the person. We all wear our struggles a little differently. When it comes to life, we know we’ll face troubles (that much is certain), but how we deal with them is where get to choose who we are being. Most of us do this fairly subconsciously. We make decisions on autopilot, fueled by our fears and learned behaviours: Our knee-jerk self defences and survival mechanisms. To be, or not to be, that is the question: Whether ’tis Nobler in the mind to suffer The Slings and Arrows of outrageous Fortune, Or to take Arms against a Sea of troubles, And by opposing end them: to die, to sleep No more; and by a sleep, to say we end The Heart-ache, and the thousand Natural shocks That Flesh is heir to? Okay, so Hamlet had some issues and was kind of a downer. He goes a bit extreme, to be sure (though things were definitely rotten in his neighborhood). But what I’m pointing to is how we struggle and what we think our choices are when it comes to dealing with them. Do you suffer, take arms or give up/sleep? You know the term “fight or flight,” right? It’s a basic evolutionary concept: When faced with a sabre-tooth tiger, our ancestors needed to be able to weigh the odds, costs and benefits to fighting, or running, for their lives (and they needed to decide rather quickly, since tigers are not well-known for their patience and good humor: “No, it’s cool, man. You just take your time and decide. I can eat you later.”). Fight: Some people face their issues head on (some people even face things that aren’t issues head on, creating struggle where it isn’t necessary, but that’s a different post). These people might seem angry or aggressive, intimidating to work with or be around. They might be tired. Fighting can really take it out of you, after all. Flight: Other people peace out, running away from their problems. These people quit. They give up. Wave the white flag. Disengage. They might seem flakey or insincere; not someone you can depend on. Avoid: Or, they might curl up in a ball, going with avoidance and choosing the “none-of-the-above” option: They ignore the issues and pretend everything’s just fine. 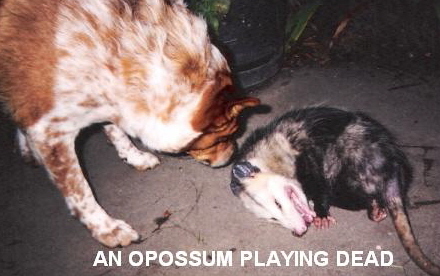 This playing possum is referred to “apparent death” in the animal kingdom: “If I play dead, I may just get out of this alive” (oh, the irony is beautiful, isn’t it?). What might be lost in life when we pretend that what is, isn’t? Whether you view the former as headstrong and aggressive, or the latter two as weak and cowardly, all depends on where you place yourself on the continuum. While you read the above descriptions, were you slotting your friends and family members into their appropriate categories? Don’t worry; we all tend to do that. After all, it’s much easier to identify other people’s survival mechanisms than our own blind spots. It’s kind of a can’t-see-the-forest-for-the-trees kind of thing. Now, I’m not saying there’s anything wrong with any of these responses (fight, flight or ignore) and I realize that there is a whole huge spectrum of strategies that people employ within these three categories. Sometimes, you need to stand up/speak up/fight for something or someone you believe in. Sometimes, it takes more fortitude to hold your head up, keep your mouth closed and walk away. Other times still, choosing to not perceive an issue as a problem at all can provide us with peace and reduce our stress (and certainly we can often have a tendency to make issues where there are none). The point I’m trying to make is that I believe we can be choosing how we respond, rather than letting our survival mechanisms decide for us. By being present (not reliving the past and not predicting the future) and coming from our essence, the core of who we are, we can actually choose how we react and interact with the matters of our lives, from an empowered and authentic place. And that, my friends, is called living. What can you see for yourself? Do you fight, flee or avoid your struggles? Is everything in your way a skirmish? Are you a sprinter? Or do you choose to ignore your challenges?